It is important to understand that the Moon rules the home and the family. It also rules the emotions, feelings, sensitivities and moods, while Venus rules Love, beauty and relationships. The Moon is emotional, while Venus is aesthetic and artistic. There is an emotional attachment or response to beauty. This aspect is charming and pleasing in relationships and enjoys the opportunity to be social. Keep in mind that the Moon naturally rules the home and the family, while Venus naturally rules committed relationships, personal finances and earned income. 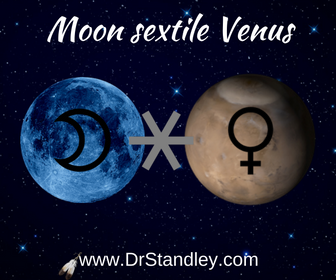 Since a sextile brings about more easy and effortless energy this aspect is favorable to matters concerning the home life, marriage and the money that impacts it. This aspect is a wonderful indicator for a happy and successful marriage and home life. Read more in my Astrology Aspects eBook - click the graphic below!